The EZ-BridgeLT+HD is a Industrial Strength high power outdoor 250mW wireless bridge system operating in the 2.4GHz unlicensed frequency spectrum providing real world thruput up to 100 Mb/sec. It complies with the 802.11g and n standards to insure interoperability. The EZ-BridgeLT+HD comes with two 75' shielded, outdoor rated(CMX) CAT5 cable assemblies and POE Inserters with built in surge protection on the Ethernet data and power lines. The EZ-Bridge creates a transparent wireless bridge between two networks up to 3 miles apart with good line of sight. It supports multiple MAC addresses and DHCP across the wireless link. It is the perfect plug and play solution for connecting the networks in two or more buildings, internet access sharing, remote video surveillance or remote network access. Multiple EZ-Bridge units can be connected in a mesh configuration to allow interconnecting more than two sites. Using the EZ-GO+ Wireless Network Expansion Units, you can create a network between an odd number of buildings like 3 or 5 sites. With its password verification, MAC address authentication, SSID suppression and advanced WPA2 encryption, the system provides the best available wireless data security. Installation is a snap because of the plug and play features which have been built into the system. Just install the antennas and plug in the power supplies. The units will automatically find their peer and create a secure wireless network link. If changes to the pre-configured settings are desired, they can be easily done thru the built-in web interface from any point on either side of the network. There are no drivers or software that needs to be loaded to the computer. 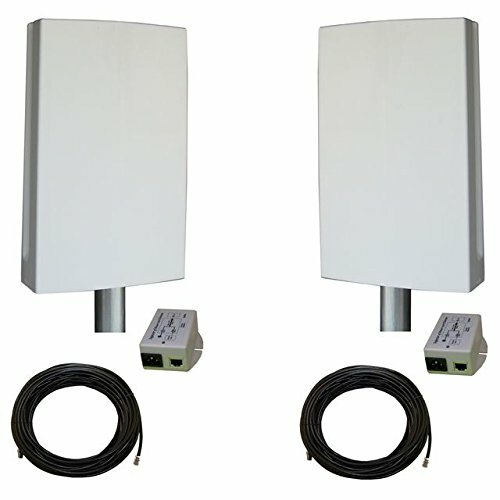 The EZ-BridgeLT+HD comes complete with all the electronics that are needed for a point to point wireless network bridge installation; including 2 powerful 14dBi MIMO antennas with built-in 802.11gn high power electronics, Bracket Kits which accommodate pole or wall mounting, 2 75' shielded CAT5 cables. If you have any questions about this product by e-zy.net, contact us by completing and submitting the form below. If you are looking for a specif part number, please include it with your message.